This was our finest day of (fake) flying yet. The difference? A new instructor we were assigned — a former military pilot named Norm. Easygoing, friendly, and truly interested in teaching, Norm was a pleasure to work with. He shared his knowledge about the airplane and wasn’t just checking off boxes on a form. A pleasant demeanor does wonders for the learning environment. It creates an atmosphere where students are not afraid to ask questions or seek clarification when necessary. With other instructors, I might just let a question go because of the manner in which it is likely to be answered. With an instructor like Norm, however, you can be assured before the issue is even raised that it will be addressed as a conversation among professional peers. To be sure, the job at hand is a serious one, and there are things which must be accomplished during every classroom and/or sim session, but that doesn’t mean you can’t enjoy the process. The good stuff started as soon as he entered the room. The day always starts with a pre-flight briefing, and this one was communicated so clearly and concisely that I could imagine the maneuvers while he described them. Everything was thoroughly explained, the session ran on time, and there were no surprises. First day I’ve experienced like that in this program. The other instructors are certainly knowledgeable, but as anyone who’s ever worked in the educational field can tell you, there are teachers, and there are teachers. This was the “hot weather day”, meaning high altitude airports and high atmospheric temperatures. Aviators refer to this as high density altitude. We flew out of Denver, with an altitude of about 5,800 feet (the mile high city, right?). The 35 degree (C) air temperature produced a thin atmosphere akin to what you’d find on a normal day at 9,500 feet. You’re nearly two statute miles above sea level before you even taxi away from the ramp. Now, the G-IV doesn’t mind those conditions at all… unless an engine fails. Then you might only get a 500 fpm climb rate if you’re at maximum gross weight. Which we were. And you’re surrounded by mountains. And, as can only be seen in a simulator, the area somehow was filled with ground fog and clouds which rose up to the flight levels. A challenging environment, but nothing a properly trained pilot shouldn’t be able to handle. The Level D simulator creates highly realistic visuals, sounds, and movements. These can be seen very clearly during the windshear encounter. We got one on takeoff and one on final approach. It actually gave me shivers to push the power levers forward and take off into that thunder and lightning. At night, no less. The only time the towering cumulonimbus clouds could be seen was when the lightning struck. And that was fairly often. The windshear encounter was a downburst of about 5,000 fpm, and even with the high density altitude, the aircraft was able to maintain level flight with full flaps and the landing gear down. To do that, however, I had to pitch up 25 degrees right to the edge of a stall and push the engines well past their temperature and RPM redlines. It’s surprisingly difficult to push the power levers that far forward, even when your life depends on it. It’s not a physical difficulty, but a psychological one. We’re trained not to do it when flying turbine equipment, lest we destroy a million-dollar engine. But if that’s the only thing keeping you from pancaking into the ground, well, you do what you have to do. The engine is more than happy to run there, but all the gauges turn red, warning alerts are heard, and ominous messages like “ENGINE EXCEEDENCE” and “EXCEEDENCE RECORDED” appear. 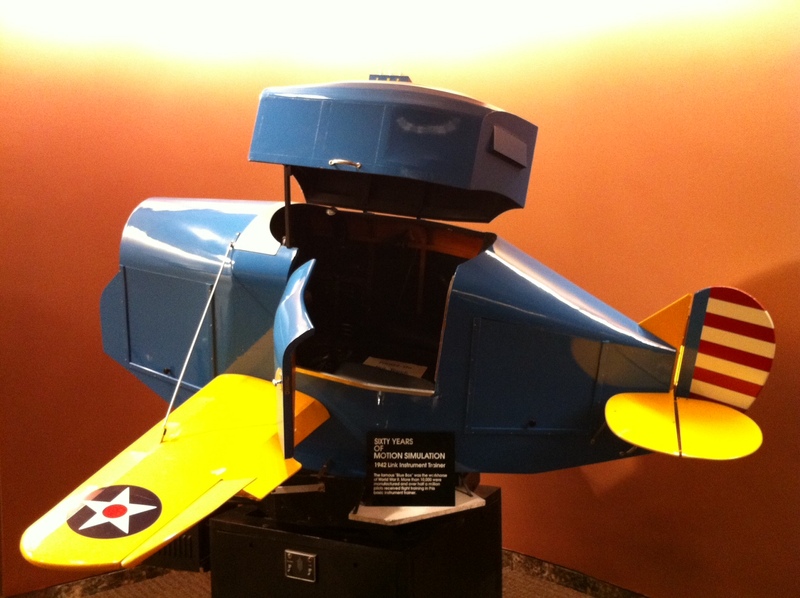 Speaking of simulators, at lunch I snapped this photo of a museum relic located in the lobby at Simuflite. It’s a Link trainer. These were built during World War II for use in training allied pilots to fly on instruments. They were the first motion-based flight simulators. 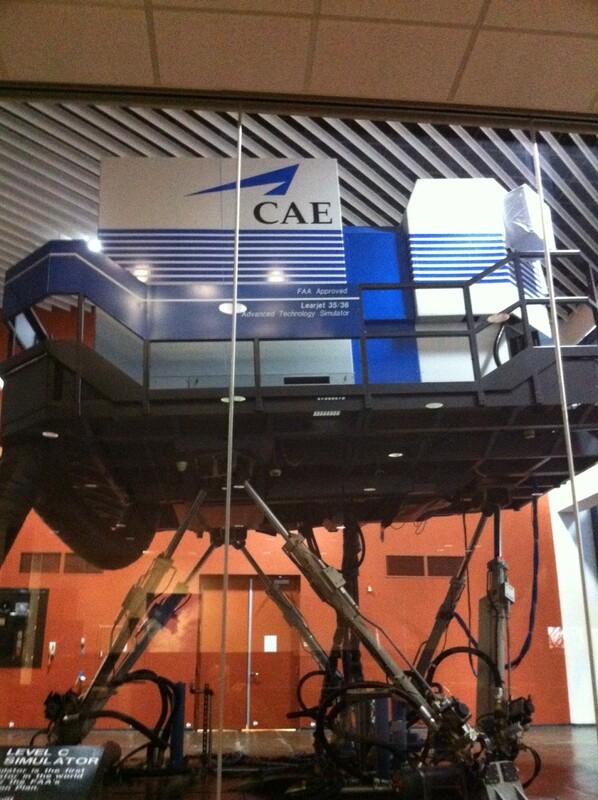 Believe it or not, this little blue thing is a direct ancestor of the Learjet “Level C” simulator you see pictured above. In fact, the two devices were both built by the same company — Link! Back in the G-IV box, another fun maneuver was the no-flaps landing. The landing speeds are, as you might imagine, higher when approaching with the flaps retracted. Add in the high density altitude and you have a recipe for very high ground speeds. High enough, in fact, to push the limits of the tire’s speed rating. Nothing quite like blowing a tire while touching down at a 195 knot ground speed to add a skosh of interest to your day. The most memorable part of today’s training came during our debriefing. My sim partner mentioned an issue he had been having with a low visibility circling approach. Norm not only took the time to explain his recommended technique for fixing the issue, he asked if we wanted to go back into the simulator and try it! 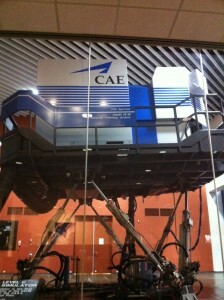 The guy was five minutes away from being done for the day, and he offered to head back into the sim, set the thing up, and let us try it. And we did — for an hour and a half. Norm was definitely dedicated to our success in the program, and it paid off for us. The circling approaches worked perfectly and are now the lowest stress item on our list. Tomorrow we’ll have a new instructor in the sim — our fifth. If you include the three guys we had in the classroom, that’s eight different people. I’m not sure I’m a fan of that sort of thing. It takes a while for students and instructors to get to know one another. As I mentioned at the top, the comfort level students have with those who teach them will affect the progress they make in their learning. It’s not a factor you’ll see noted in any syllabus, but it’s as real as any other aspect of flight training. In an ideal world, anyone could have any instructor and if they’re all standardized, the student will progress at the same pace. Unfortunately we don’t live in that ideal world. We live in this one.